Which Countries Practice Twitter Censorship and Why? Twitter is the second most popular social media network, smaller in membership only to Facebook, and unlike Facebook that has focused primarily to discussing personal topics with friends and family you know in real life, Twitter is somewhat different. Most Twitter users don’t use their own data with their accounts, which has both some advantages and some drawbacks. Anonymity has placed Twitter as one of the world’s prime political discussion platforms, and anywhere where there is politics, there is political censorship. Some countries appeal to Twitter to ban certain words, phrases, or users, while others ban Twitter in their country altogether. For those who want to access the ‘’microblogging” platform from countries where it is forbidden, they can use a Virtual Private Network (VPN) to route their connection through a country that doesn’t ban Twitter, with VPN providers such as Le VPN who have servers in over a hundred countries around the World. Although, those users should be cautious and always stay anonymous online, as accessing, tweeting, and even re-tweeting some content can be illegal in some countries and can place you in a lot of hot water. While there is a possibility for users to tweet about things besides politics, there is rarely an active user who doesn’t follow someone who does, or has at some point tweeted about politics himself. From basic things like calling people to vote to the much more serious subject like organizing protests and garnering support, with even some being downright funny like the NPC meme. Because political banter often goes outside of what is inside the Twitter community guidelines and terms of service, some might think that this would be called censorship, but it is actually not, it is just prevention of harassment. As a company, Twitter might be exhibiting some political bias due to the demographics and location of the moderators, which are in most part millennial Californians, but the policy itself doesn’t include any political presumptions. While censorship might sometimes come from an overzealous employee, it much more often comes from the government itself, by orders of the court, or as in the case of the People’s Republic of China, outright banning Twitter in the country. Following a US Senate hearing, tech giants like Facebook, Twitter, and Google, declared that they would not intentionally censor any legal content on their platforms, provided that it complies with the Terms of Service, which are equally as strict for any political leaning. 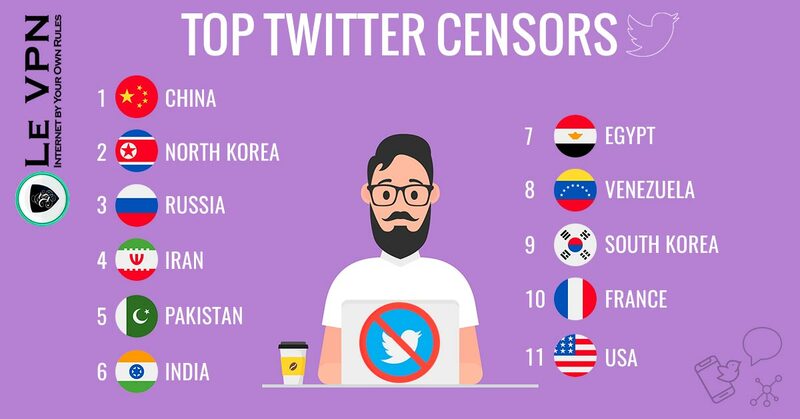 How do Countries Censor Twitter? In most cases when some country doesn’t want its citizens tweeting something, it will directly ban access from that countries IP addresses to the website, blocking the service for anyone not using a VPN based outside of the said country. As there are professional VPN providers, such as Le VPN, that operate globally, this strategy has often proved to be useless. As a different tactic, a country can appeal to Twitter with legal documents, such as verdicts and judgments, as to force the company to ban or delete certain content. This often happens when local laws differ from the US legislation under which Twitter operates, usually pertaining to free speech and publications, but also with libel or defamation. The court will inform twitter of the verdict, and the company will decide to comply or not. For a long time technically, and recently officially, Twitter has become a tool for journalists and bloggers to get their information either from their sources tweeting or directly asking people to confirm or deny any information. Most information is disseminated by people sharing stories, links, or photos of events, giving both the new media and the legacy media the opportunity to interview the people who are in the thick of it and stakeholders alike while never actually leaving the comfort of their office, or even home. The Federal court even decided in May of 2018 that the President of the United States can’t block people on twitter, as it would make it increasingly difficult for them to do their job and report on the news if they don’t have access to the president account. This has stirred several concerned about future privacy and harassment, as the verdict applies both to the official handle of any president, which is @POTUS, and to the personal handle of the 45th president of the United States, Donald Trump, who tweets often and even comments on subjects which wouldn’t be directly under the command of the president from the handle @realDonaldTrump. While most countries don’t bother with trying to influence any social media to remove or censor content, there are some who do. Some of the countries on the list were to be expected, as repression of journalism and free speech are commonplace in those regions of the world. Others have only certain issues with how social media is operated, and finally, some are countries that officially champion free speech as a value, but the government is sometimes at odds with certain movements or statements that were somehow deemed to be derogatory, inflammatory, or harmful in some other way. Although Twitter is banned in China, with the favor of the government being with the countries own Sina Weibo microblogging platform, Twitter still reports between 10 and 35 million users coming from the PRC. Users are unable to access the website or the app using local IP addresses and are forced to use VPN services to even search tweets or any content from the platform. Users in the PRC use professional VPN services like Le VPN, not only to access the social media but as to stay anonymous and mask their IP address. Although any access to Twitter in North Korea is punishable by law since 2016, this hasn’t resulted in a significant drop in the global number of users as there were few with internet access in the hermit nation in the first place. Since the ban, even foreigners with special permits are not allowed to access Twitter from the country and would be unable to do so from the few access points available. Maybe you shouldn’t risk it? While there is a possibility to use a VPN to circumvent these restrictions, any travelers to N. Korea are not advised to do so as most internet access points are heavily monitored and using a VPN alone is punishable by law. While Russia is generally known to have a very low tolerance level for any media coverage of the opposition, the country has avoided banning or censoring Twitter for the most part. The biggest incident came in the first half of 2014 with Russia demanding Twitter to ban a pro-Ukrainian account or to make it invisible for Russian users. This has later grown to multiple accounts or individual tweets that were deemed to break Russian law. Any user in Russia who wanted to access that Twitter account needed to use a VPN from any other country. Finally, Twitter banned a hacking collective in July of the same year for leaking several documents of the Kremlin to the media, which breached both the Russian law and Twitter’s own terms of service. People traveling to Russia should consider that due to Russia banning many online services and pages, some apps might be unavailable using a Russian ISP (internet service provider), especially for iOS. Because of this, travelers should use the best VPN for iPhone or Android that they can find, and always keep the app ON when connecting to a local WiFi. While most people believe that North Korea bans most websites through their ISP, this title actually goes to Iran, which has been increasing the number of sites blocked steadily since 2009. Twitter was banned in 2009 following protests that were organized through this platform, and the new government never lifted the ban. Users that are living in, or traveling to Iran, are highly recommended to use a VPN, as the internet service providers (ISP) in this country are suspected of monitoring any communication and deny access to most popular global platforms such as YouTube, Facebook, or Instagram. Users in Iran need to use VPN to both access the internet freely and to mask their IP location, staying anonymous and safe. While Pakistan allows users inside the country to access Twitter freely, they have demanded that all kinds of words, phrases, and even entire accounts be blocked or removed due to them being ‘’blasphemous”. This has mostly focused on domestic topics and removal of any anti-Islamic notions from the platform but has strangely also impacted atheist and Wiccan accounts. Any user in Pakistan is strongly advised always to use a VPN and stay anonymous while tweeting, as multiple issues could be deemed blasphemous and would result in legal punishment. While India doesn’t usually meddle with censorship of any social media, they have requested for the spoof accounts of the Prime Minister of India to be deleted in 2012, following the violence in Assam. Several accounts impersonating the PMs official account, or any account impersonating the then PM Manmohan Singh, were removed from the platform. There is currently no part of Twitter that is being banned or censored in Egypt, which is a stark difference with the situation prior, and especially during the Arab Spring in Egypt, and the massive protests that have occurred against the then president Hosni Mubarak, who was by that moment ruling the country for thirty years. Twitter became inaccessible through local ISP providers in January 25th, 2011, with many users switching to VPN to live stream and tweet what is on the ground. Just two days later the domestic ISPs disabled all internet access to and from the country, leaving all Egyptians without internet. To combat this, Twitter joined with Google and SayNow to allow Egyptian users to send in their tweets via voicemail and to listen to comments in the same way. Once the protests succeeded and the government was changed, all restrictions on the internet in this nation were removed. Users in the country are still advised to use a VPN, but more for personal reasons such as identity security and cybersecurity, not government oppression. Although the service itself was still active, during the Venezuelan Riots in 2014, all images from the country were blocked, including those on Twitter. This was to prevent the current government narrative that there was only a handful of protestors from collapsing. As Twitter gave the users in Venezuela an option to work around this issue by using phone messages, freedom of expression in the country was preserved, and it was shown that most of the country was in disarray. While the government of South Korea isn’t known for banning and blocking websites, there are currently about 65 URLs that are inaccessible while using a South Korean IP address, one of which is the official Twitter account of North Korea with the handle @uriminzok, which roughly translates to ‘’our people” in Korean. As S. Korea deemed that most of which can be seen on the twitter account profile were propaganda, the country banned the access to both Korean and English versions of the profile. Currently, you need to use a VPN with a server outside of South Korea to visit the Twitter of their northern neighbors, who’s twitter page in English has gained more than 50 thousand followers so far. In January of 2013, a series of anti-Semitic posts were made on Twitter, all in French. Although these posts were promptly deleted from Twitter as they violate the Terms of Service, the Union of Jewish Students of France, UEJF (French: Union des étudiants Juifs de France), has filed a lawsuit. The goal was to force Twitter to disclose the user information of the users to the general public as the content was determined to be hate speech by the French law. For any non-compliance the company would be charged around $1300 each day, which was finally impossible to enforce, as Twitter has no offices or personnel in the Republic. Last but not least, the base country of Twitter, the good ol’ land of the free and the home of the brave. There are only a few instances of the federal government ever directly influencing Twitter in order to ban or delete content. The company itself is biased slightly to Californian standards when it comes to politics, and has been found to be more lenient to the representatives of the policies they support, with regular bans for accounts that have been deemed to spread hate by Twitter alone. The only direct ruling from the Federal Court was that the President, Donald Trump, isn’t able to block anyone from his personal twitter handle, although he is able to mute people and is under the same protection from harassment like any other user. Most attacks on the freedom of expression on Twitter were made by the company itself, without any direct influence by any administration, state or federal. In 2018 alone there were multiple instances of Twitter censorship, banning or un-indexing certain users, as well as removing certain trends from appearing. In some cases, these accounts and trends were in clear violation of the terms of service, while in others it is unknown which rule they might break. In some cases, even accounts of known news outlets, such as the Daily Caller, were temporarily banned from the platform. Additionally, some trends were promoted as news by mainstream media sites, such as one trend that was removed in the fall of 2018, which has a very anti-Semitic sentiment, but was actually a transcription from the news broadcasted by CNN. Prior to this, Twitter followed other large social media tech companies in removing the part-time newsperson and full-time conspiracy theorist Alex Jones from the platform, forcing an outcry on the platform itself, both from those who believed the conspiracy theories made by Jones and those who have seen the longtime media personality as a source of entertainment. Following the 2016 US presidential election, most Twitter users realized that there was a significant number of accounts on the social network that were overtly political, with little additional content or interaction. While some of these accounts were run by enthusiasts that volunteered on political campaigns, some were a product of so-called ‘’Bot Farms’’ that were made in places like Russia, Belarus, Turkey, or Saudi Arabia, and which had a goal to sway people on one political side or the other. Once this was established, Twitter monitored these accounts, and if there were any accounts that had the same content and came from the same IP address, these accounts were banned. How this was determined it is still unknown. After the so-called ‘’Purge’’, many conservatives used the occasion of declare themselves the ‘’Free Speech Party’’ and to defy Twitter censorship, and while most of those who hold free speech in high regard are right-leaning, there are fringe elements on the right, such as the white- identitarian Alt-Right, which has openly declared to be against free speech and expression. The NPC meme started on the 4Chan forum and is a revision of the idea of the philosophical zombie, pioneered by the French philosopher René Descartes and built upon by some like Harvard’s Daniel Dennett, or Australian David John Chalmers. The meme uses current vocabulary to explain the phenomena, comparing people who don’t use critical speech or critical thinking to ‘’Non-Playable Characters” in video games. As this insult was usually used to insult people who are left-leaning and was thus happily used by the conservatives, it was deemed inflammatory and banned from Twitter, with all users who made mocking NPC accounts being removed permanently. In the summer of 2018, Vice News reported that several conservative pundits and supporters no longer appear on searches, even though their accounts were not banned or deleted. This was shared by multiple republican, right-wing people, and centrist users to indicate shadow banning of users with which Twitter doesn’t agree. Both the Twitter spokesperson Ms. Leslie Berland, and even the Twitter CEO Jack Dorsey, have flatly denied that this practice was ever used, but there is some evidence on Reddit and other websites that pose strong arguments otherwise. While Twitter censorship is not as widespread as an average Twitter user would lead you to believe, it does exist, and it is most often influenced by various governments and groups that use all possible means to control the flow of information over this social network. In the era where freedom of speech is under attack at every corner, and most information must be provided by activists and journalists on the ground, this should not be tolerated. 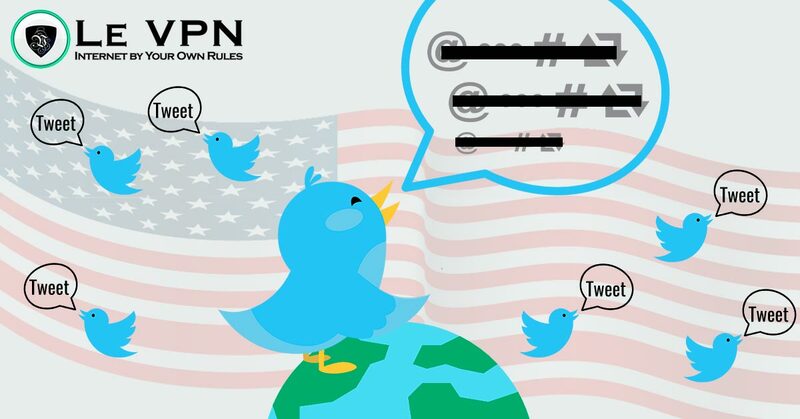 For those who reside in countries where Twitter is banned, use a reliable and versatile VPN provider such as Le VPN, which has multiple servers in 114 countries, and with which you will be able to access any information found on social media platforms and to access both the information censored by the government officials, and the one removed by the tech company itself. Thankfully, there is a growing free speech wing on a global level, with bi-partisan users joining to ensure that political censorship will not be in the domain of national governments or giant tech companies.